Bajra aur Gur ki Roti (Pearl Millet and Jaggery Flatbread) is a great way for diabetic or even weight-watchers to enjoy sweets. Pearl Millet (Bajra) is rich in protein, fibre, phosphorous, magnesium and iron and hence has many health benefits. Bajra is also rich in essential amino acids and vitamins. As pearl millet has high fibre, content it digests slowly and hence glucose is released slowly. This will help in maintaining a healthy blood sugar levels for a long period. Since the fibre content is high and this curbs hunger for a long span of time. The insoluble fibre that bajra is rich in aids digestion. This reduces secretion of bile acids and lowers the risk of gallstone formation. Bajra contains called phytic acid that is believed to increase cholesterol metabolism this stabilises the level of cholesterol in the body. Consumption of Bajra reduces the risk of cancer. But as in all cases, moderation is the rule consume bajra in moderation and avoid it in summer. In India: கம்பு (Kambu in Tamil); (“Kambam” in Malayalam) ; बाजरी (Bajri in Rajasthani, Gujarati and Marathi), ಸಜ್ಜೆ / ಕಂಬು(Sajje/kambu in Kannada); बाजरा (Bajra in Hindi, Urdu and Punjabi) and సజ్జలు (sajjalu in Telugu) and বাজরা (“ba:jra:” in Bengali). I have copied this recipe from here. Warm the water and add the jaggery to it. Set aside for the jaggery to dissolve. In case, you are in a hurry crush the jaggery and then add to the water. Once the jaggery has dissolved and you have crushed out any lumps add the bajra dough (I used 1/2 cup first the added 1/4 cup more) and knead to make a dough. Take care it is not sticky add more flour if you need to. Since the flour is gluten-free, you will not be able to get the wheat dough kind of consistency. It will break and crack but still knead it to get a smooth dough. Use oil or ghee to help. Grease your hands with ghee or oil and then flatten the dough with your hands to about 1/2 inch thickness. Heat a tava/skillet transfer the roti gently to the tava and cook on a very slow flame using ghee or oil. Flip and cook again use ghee/oil and cook on both sides until crisp and nicely caramelized. Brush some more ghee on top if you like. Thicker roti will mean longer cook time but thinner rotis are very difficult to handle and they break up from the board to tawa journey. Bajra aur Gur ki Roti (Pearl Millet and Jaggery Flatbread) is a great way for a diabetic or even weight watchers to enjoy sweets. Once the jaggery has dissolved and you have crushed out any lumps add the bajra dough (I used 1/2 cup first the added 1/4 cup more) and knead /to make a dough. Take care it is not sticky add more flour if you need to. Thicker roti will mean longer cook time but thiner rotis are ver difficult to handle and they break up from the board to tawa journey. 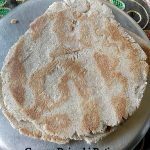 That is a very nutritious and delicious flatbread with bajra and jaggery. I want to try this recipe asap — looks so rustic and yummy!! Never tasted bajra gur ki roti. It reminds me of sondhi smell of pure deshi food. I am sure it will be delicious ???? What an yummy and healthy flatbread. I have to search for pearl millet. After knowing the health benefits one must use this soon. You can order on Amazon Uma. 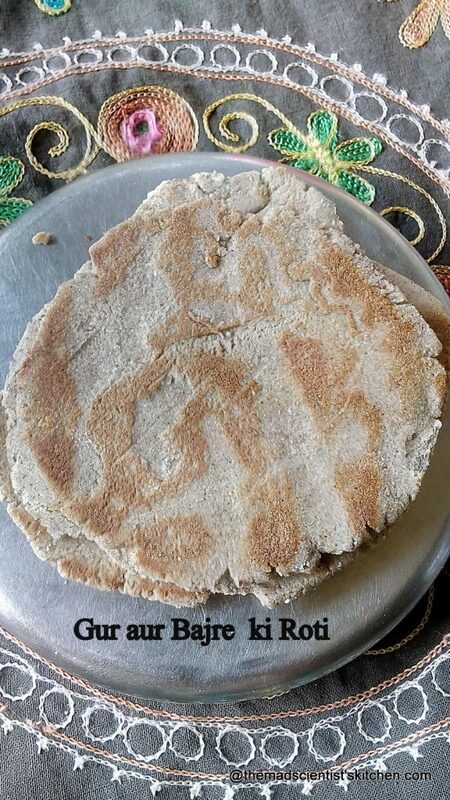 My grandma makes similar flatbread with finger millet flour. 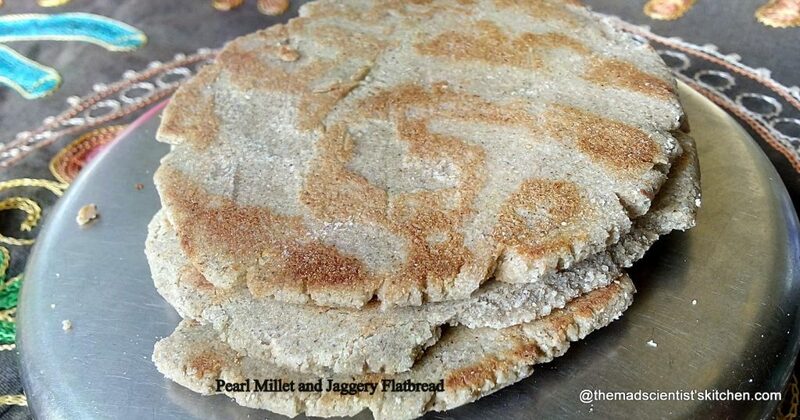 Am sure this pearl millet jaggery flatbread will definitely please my sweet tooth.Nutritious!! I have to try finger millet ones. Thanks, Priya. A perfect winter food.. we eat a lot of bajra dishes in winters. I often make Bajra roti during winters..but never tried the sweet version…your post is tempting me to try it out soon ???? Yes please do try Poonam but now you will have to wait till winter. Very nutritious and delicious roti…I love the fact that it’s a sweet version…Very tempting!! Looks really good. I make bajra roti or rotlo as we call it often but have not tried a sweet one. My grandfather would crush the roasted rotlo with a big go ghee and grated ladoo and give it to us. Hai Mayuri bachpan ki yaad kara de.We made the same out of chapatti. I loved it. I’ve never tried this flatbread, it sounds great! This is new to me, never made this way with bajra. Looks tasty. A true blue rustic and robust recipe with all the old world charm possible! ???? I love bajray ki roti with soupy daals and curries. And I love gur ka paratha. This recipe combines two of my favourites so double the craving. ???? This is what I’ll be making for my sehri (Ramadan breakfast today). Maria, I love your comments. Isn’t it too hot for this now for Sehri? Thank you, Avin. We loved the taste a lot. Wow, that is a classic recipe you have executed to perfection. lt is in perfect time for me as it is getting cold here. Lucky you because it is getting cold. We want to escape the sweltering heat.